November | 2013 | Beer Apprentice - Craft Beer News, Reviews, Interviews and Info. Hello everyone. For today’s craft beer review I’m going to be trying the Schnieder Weisse Tap 4 Wiesen Edel-Weisse brewed by the Private Weissbeirbrauerei G. Schneider & Sohn GmbH brewery located in Altstadt Kelheim, Germany. I haven’t had too many beer from Scnieder Weisse, but the one’s that I’ve tried have been solid to the core, so I’m expecting nothing less from this brew. I checked on the website, schnieder-weisse.de, and found this short, but informative bit of info about this brew. Exclusively brewed in reminiscence of Georg Schneiders privilege of being part of the world famous Munich Octoberfest until 1942 when his renowned “Weisse Brauhaus im Tal, Munich” was destroyed. Enjoy and celebrate! Let’s have a sip, shall we? This beer came in a 16.9 oz. bottle and it had an ABV of 6.2%. It poured a very hazy, golden/honey color with a bright white, fluffy, soft, soapy and somewhat rocky head. It was sized extremely well and the retention time was more than solid. The lacing didn’t look too bad either. This appeared to be a typical wheat beer in the glass. Very enticing and inviting. The nose was very bready and yeasty. Hints of overripe banana. Strong aspects of clove too. It had almost a sorghum type of aroma as well. Interesting to say the least. I can’t say that I’ve ever experienced that in a wheat beer. It wasn’t off putting at all…. just different and unique for sure. The taste was a bit more typical of a Weisse beer I thought. More of the bread and yeast with sturdy tones of the spicy clove while the pleasant fruitiness of the banana coincided with a stable and commonplace accent of grain. A nice and sound flavor with this one. The mouthfeel was medium bodied. Smooth, but crisp and airy. It was somewhat dry, yet not too dry to be refreshing and thirst quenching. An ok amount of flavor was left behind also. Just enough to keep me interested and wanting to take another gulp. Overall, I found this to be an alright beer. It was a very easy drink and would obviously be great for the Spring and Summertime weather. It’s definitely worth a try if you favor this style. It has all of the appropriate components and it’s pronounced enough to keep a person interested for the entire session. I’ll probably be on the lookout for it next year if they produce it again. 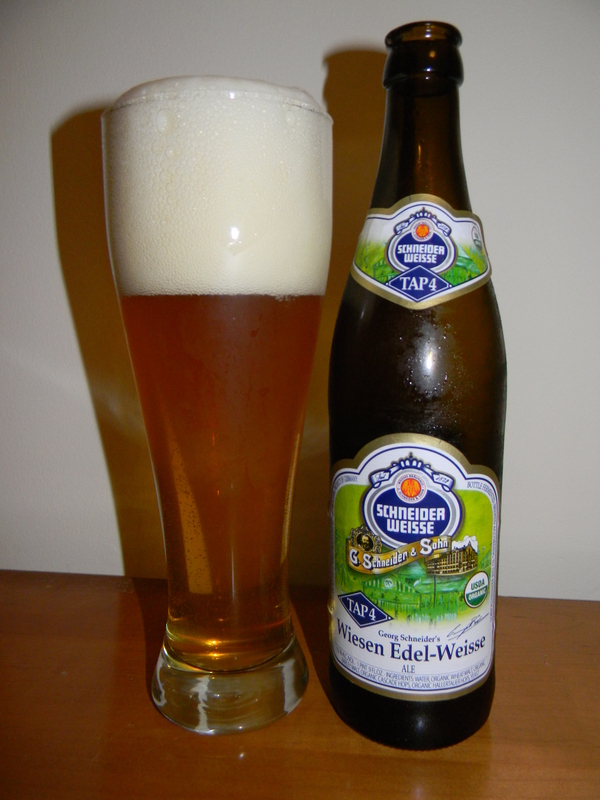 Have you guys ever tried the Schnieder Weisse Tap 4 Wiesen Edel-Weisse? If so, what did you think of it? Did you like it? Feel free to leave your opinion in the comments. I really enjoy the interaction. Hello everyone. Thanks for checking in on another craft beer review. Sorry that’s it’s been a bit since I last posted. 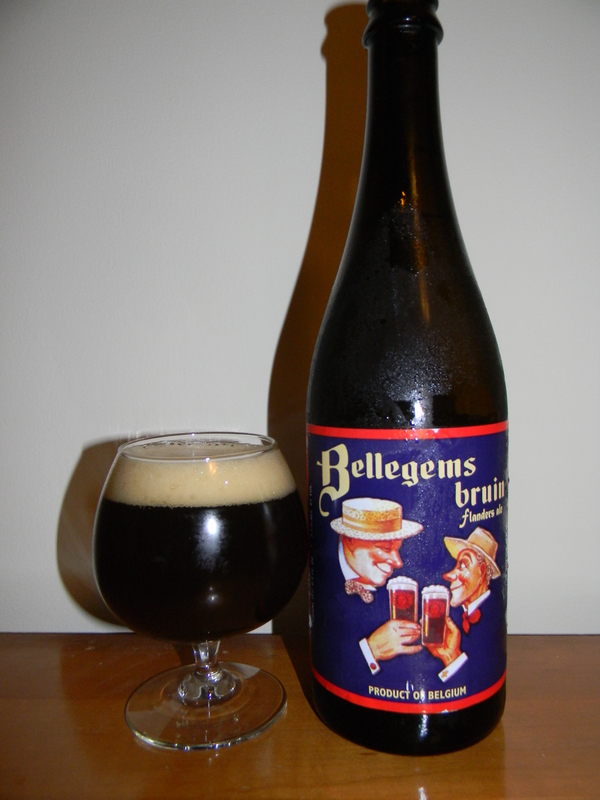 Well, for today’s tasting I’m going to be trying the Bellegems Bruin produced by Brouwerij Bockor N.V. located in Bellegem-Kortrijk, Belgium. I’ve really been craving an Oud Bruin lately, so I figured I’d give this one a go. Let’s check on the website, bocker.be, and see what they have to say about this beer. Originally called “Ouden Tripel”, this ancient West Flanders Brown beer has found a new élan as a regional specialty under its current name: “Bellegems bruin”. The main ingredients of our Bellegems Bruin are malted barley, wheat, hops, water, and caramelized malts. These are used to brew a bottom-fermented beer. Blending this beer with lambic beer aged in oak for 18 months results in this specific West Flanders Brown beer. Its typical flavour is characterized by a well-balanced, hardly noticeable sourness. This first flavour impression is soon followed by a second pleasant discovery: a slight bitterness followed by a hint of sweetness. This beer came in a 25.4 oz. bottle and it had an ABV of 5.5%. It poured a brown color with some ruby highlights showing through when held toward the light. A fairly well sized, off white head was formed from a relatively easy pour. It was a bit fizzy and soapy in texture and it subsided a little quicker than I’d hoped. The lacing was thin and a touch inconsistent, however a small ring of foam was left on the liquid around the edge of the glass. The nose brought forth hints of soured grapes and cherries. It smelled tart and acidic. Only a minor amount of oak was found and it seemed to be buried deep within. It was very “red wine” like with the bouquet, which is always a good thing in my opinion. It wasn’t overly complicated, yet solid and true to the style I thought. The taste let loose of more of the soured grapes and cherries. I also detected a dab of soured red apple, which added to the semi-tart profile. A slight relish of acidity and vinegar was found along side a nice savor of wood/oak. Towards the end some earthy goodness intermingled with all of the characteristics to create a very nice and harmonious palatableness. The mouthfeel was medium bodied. Bitey, semi-sharp and mostly dry. The carbonation was of medium strength and a good deal of seasoning was left behind of the roof on the mouth and tongue for me to enjoy between each sip. Overall, I found this to be a very, very nice and proper brew. It wasn’t extraordinary, however it still had plenty to be happy about and enough personality to sit and ponder. I know I really enjoyed it that’s for sure. It was plenty easy to drink and I wouldn’t have a bit of a problem sharing or recommending this beer to anyone interested in trying a traditional Oud Bruin. So, if you guys happen to run across a bottle of the Bellegems Bruin, pick it up and give it a go. I think that you may find it to be very satisfying. Thanks for reading and commenting everyone. I’m forever grateful. How’s it going guys? Thanks for checking back in on another craft beer review. For today’s tasting I’m going to be trying the Orkney Red MacGregor brewed by the Orkney Brewery located in Orkney, Scotland. I’m still new to the Orkney line of beers, so I haven’t really made up my mind as to what I think of them as a whole yet, but I’m definitely going to have fun giving each one a test drive. From the website, sinclairbreweries.co.uk, they provided us with this tid bit of information regarding the Red MacGregor. 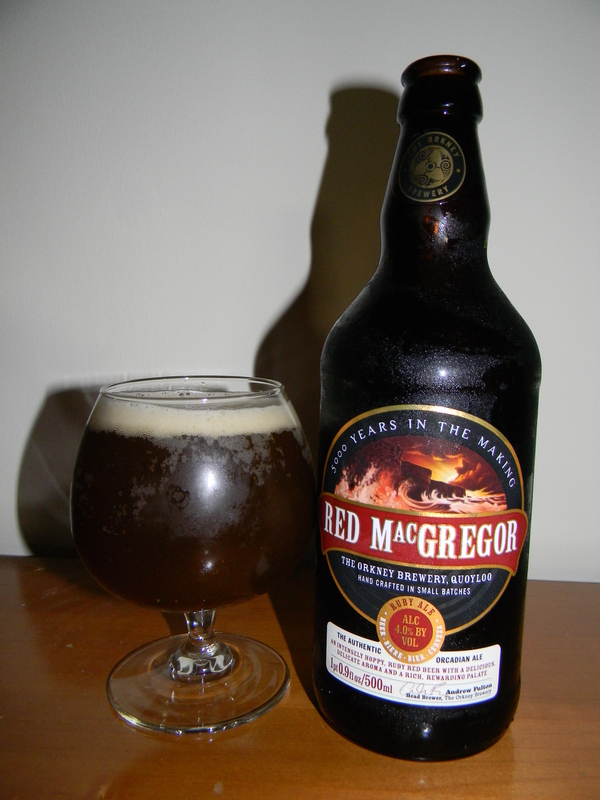 Red Macgregor is a unique beer: delicate and sophisticated yet the robust cask conditioned version of this beer was the first Scottish beer to win the BIIA World Cask Beer Gold Medal. Ok. Let’s turn this thing up. This beer came in a 16.9 oz. bottle with a 4.0% ABV. It poured a ruby red to deep burgundy color. A relatively easy discharge produced a medium sized, semi-smooth, off white head. The retention time was below average, however the lacing looked ok I thought. The nose produced hints of fruity cherry and grape. A very agreeable and engaging sweet smelling toffee and/or caramel malt amalgamated itself with a congenial waft of lightly toasted dark breads. Overall, the bouquet wasn’t extremely complex or bold, but it was well suited. Definitely nothing off putting or out of place with this one. The taste let the caramel malt and the slightly toasted breads stand out a bit more than they did in the aroma. The cherry and grape savors were there, however they were understated quite a bit to be honest. The maltiness was, without a doubt, the star of this show. Again, nothing too convoluted, yet nothing perplexing either. The mouthfeel was medium bodied. It was very soft, smooth and delicate. It was semi-dry and the carbonation fell toward the medium side of things as well. The flavor vanished from the palate a little quicker than I would have liked, but that’s ok. It just tempted me to take another sip a little quicker than normal. Yeah, I thought this was a decent beer for sure. It’s not the best brew I’ve ever had, but it’s worth a try if you happen to run across it. It’s an easy drink and with the low ABV a person could enjoy a few of these during one session and not have any problem whatsoever. It has a lot of positive atributes. Most notably when it warmed and the breads and malts began to shine. With that being said, give the Orkney Red MacGregor a try and see what you think. Be sure to tell me of your opinion when you do.